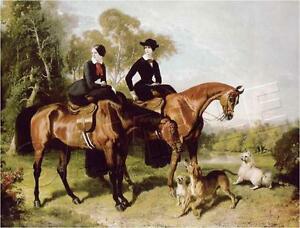 Edition Size: 8.5" x 11" Size Type/ Largest Dimension: 11" x 8.5"
"Two Ladies Posing Sidesaddle On Their Horses". Looking for more SIDE SADDLE LADIES?. We have an ever-expanding gallery of exciting and unique SIDESADDLE PRINTS for your consideration! The texture and colors of this reproduction will be a delight to enjoy in any setting.